Libraries are like old closets and attics, magical and full of mystery and adventure. Did you know that this week is National Library Week? For librarians, visit the official website. For library lovers visit the other official website. 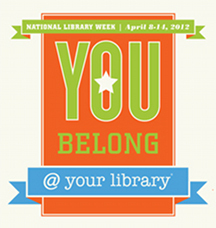 You can also participate on the @your library page on Facebook and @AtYourLibrary on Twitter. Also, aside from the month of April being National Poetry Month, it's also School Library Month. Click here to visit the official School Library Month website. Why am I just now posting about this? Because this week has whizzed by like a bumble bee chased by a mad puppy. But I still wanted to show my support. My local library is the Provo City Library and it is one heck of a place. The people, the events, the book selection, the facilities, everything is wonderful. For example, about the events (which is what I'm super keen on), did you know that Skippyjon Jones creator Judy Schachner is coming? Yes! She is the guest of honor for this year's Children's Book Festival! Also, the Provo Library is one of the official Children's Book Week spots! The main event will be on May 12th, but there will also be a couple of mini-events during the week leading up to the main event. Click here for all the details. And just before the Children's Book Festival, guess who's coming? RICK RIORDAN. But the turnout is expected to be so large that the event will take place in the local Timpview high school auditorium. Click here to find out more. To learn about other upcoming author visits, click here. Sheila Nielson, author of the teen fantasy, mermaid story Forbidden Sea. Online, Sheila can be found here and here. Carla Morris, author of the picture book The Boy Who Was Raised by Librarians. Carla's website can be found here. As for those who write who also work at the Provo Library, there are probably tons. One in particular I know of is the fantabulous community relations coordinator Courtney Lowe. She loves horror and has a manuscript involving Valkyrie. She is also the one responsible for all of the amazing author visits which have put the library, and consequently Provo itself, on the hot list of places for publishers to send authors. Provo Library rocks. And if you live somewhere else, your library rocks too. and your feet by walking in. I LOVE LOVE LOVE the Provo Library. I live in Orem, but I use the Provo Library because it is so superior! I didn't know that Carla Morris worked there. Her book was cute! Yeah, Provo Library is great, but I can't wait for the Center for Story at the Orem Library. That will be a great place for events! Maybe you can come visit!